The St. Johns River winds and turns as it flows northward through central Florida. 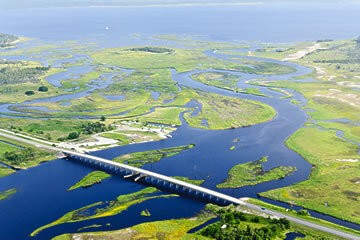 Florida faces many challenges in meeting future demands for water, while maintaining healthy, natural systems. Water resources can be protected through establishing minimum flows and levels (MFLs) for priority water bodies and the use of water reservations. MFLs are established to protect water resources from significant harm that might result if too much water is withdrawn for people’s use. MFLs are used both in planning where new water sources could be developed and in regulating water withdrawals. The water management districts use a variety of information to scientifically establish the point beyond which additional withdrawals would cause significant harm. Usually, the districts select a peer review committee to evaluate the scientific principles and methods used to establish an MFL. Once an MFL is calculated, it is adopted by rule and implemented by the districts. Priorities for adopting MFLs are established based on the environmental, cultural and historic importance of the water body to the state or region, and the potential for significant harm from current and planned water withdrawals to meet existing or projected future needs. 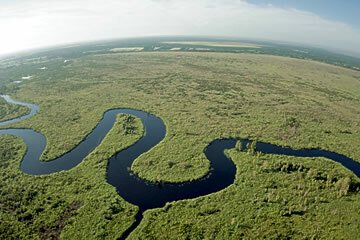 Lake Istokpoga Canal meanders through the Kissimmee River basin. For water bodies that are below their MFLs or are projected to fall below within 20 years, the water management districts are required to implement a recovery or prevention strategy to ensure the MFL is maintained. Reservations set aside water from withdrawal as necessary for the protection of fish and wildlife or public health and safety. In many instances, the water management districts will scientifically identify the quantity, duration and timing of water that is necessary to protect fish and wildlife. Reservations may be calculated to reflect seasonal variations in flows or levels. The water management districts use water reservations for several purposes, such as to assist with a natural resource restoration project or as part of a recovery strategy to achieve a minimum flow and level on a water body. When the reservation is in place, the quantity of water reserved is set aside for the natural system and may not be withdrawn for human use. The Central Florida Water Initiative Minimum Flows and Levels and Reservations Team is working to evaluate the status of existing MFLs and reservations and develop collaborative measures (measuring sticks) to be applied consistently across the CFWI area to evaluate the effect of existing and proposed water withdrawal scenarios. The Team is also coordinating with other technical teams to complete the initial assessments of groundwater availability in the CFWI.